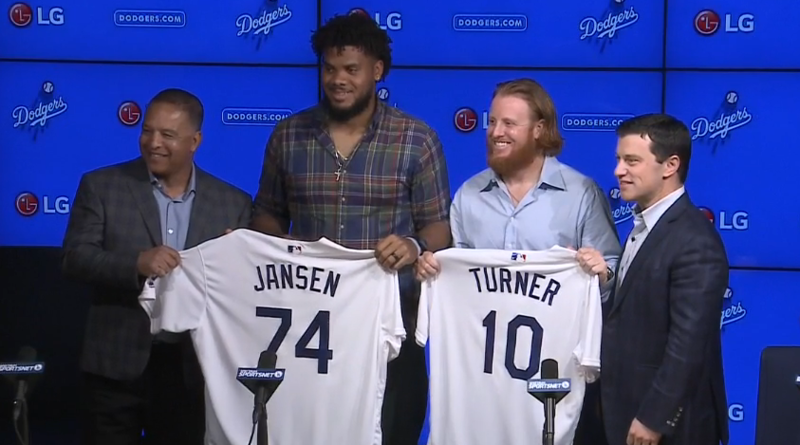 The Dodgers held a press conference for recent signees Justin Turner and Kenley Jansen yesterday after both their deals were finally made official, and while a lot of information was provided that we were already aware of, there were some interesting tidbits we didn’t get before as well as news on players other than the two sitting at the table (1/2/3/4/5). Andrew Friedman spoke of the Kenley, Turner, and Rich Hill signings as part of the direction they want to go with in terms of the clubhouse dynamics. “It’s part of that clubhouse dynamic, that culture that we’re trying to cultivate and continue to build,” Friedman said. He also spoke about how despite the history of relievers on long-term deals bombing and JT’s previous health issues and odd career path, the ownership was supportive of giving the front office the payroll to go out and bring the duo back. Personally, I’ve always found the label that they relied solely on numbers to be odd, or at least those people had to be ignoring all the quotes they give about building a culture and their overhaul of the scouting and player development departments. The moves aside, the organization seems to be moving in the right direction. …and hopes other down there look to him as the role model. Kenley seemed to feel the same about JT’s influence. “With J.T., sometimes when I get out of line — I’m not going to lie — he’ll pull me aside and put me back on track,” Jansen said. And he mentioned JT helping all his teammates (even when things don’t go well for him). Neither seemed to deny that money was a factor, just that it wasn’t everything and their main goal is to win. They also confirmed the story that things started to change during Kenley’s wedding in Curacao when JT, Yasiel Puig, and Scott Van Slyke were down there. And a lot of the decision seemed to be based on the direction the guys in the dugout were taking the team. For whatever you think of Roberts’ decisions in the game (and I always let you know what I think about those), it’s impossible to argue that he’s taken control of the clubhouse, will make unconventional decisions in order to win, and has developed the credibility with players to use his style without serious backlash. It’s impressive and he continues to validate his hire. Speaking of Puig, for what seems like the third off-season in a row, we’re talking about whether he can get it together. I still hope for Puig, but admittedly at this point it’s mainly hope and just my wish for success because he’s fun. But in reality, it’s a “I’ll believe it when I see it” thing at this point. Speaking of outfielders, Trayce Thompson‘s literal broken back is not yet 100%. This kind of stuff is why I’m not sure how the Dodgers pursuit of outfielders is dismissed out of hand. Yes, I totally agree that second base should be a priority, but Dustin‘s articles about outfield upgrades are a legit alternative path. While the team has a ton of seemingly quality outfielders, for reasons like experience or injury or … Puig the Dodgers can only really rely on Joc Pederson right now for production. Thus, exploring a more reliable option seems like a valid way to improve. MLB Tonight also talked with Friedman after the press conference, and besides the default Brian Dozier talk, I found the convo about Julio Urias‘ innings and a Corey Seager extension interesting. There’s no clear answer to the Urias question, but it certainly sounds like they would consider starting him in the minors, which the rotation depth would allow without much issue. 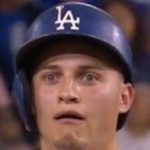 And I really think Friedman wanted to say to the Seager suggestion, “Corey’s agent is Scott Boras, he’s not signing a goddamn extension now.” Friedman also admits that the outfield is Joc and … a bunch of dudes. Good dudes, but still hardly anything reliable.